Caption slip reads: "Photographer: Gaze. Date: 1953-08-26. Reporter: Gaze. Assignment: Dog owner fined. 48: Anatole Tartakoff, 1355 Ocean Front, Santa Monica, with his 'best friend,' a one-year-old black and white cocker spaniel named 'Geranium'. Tartakoff was fined $25 and put on probation for one year today after being found guilty of violating city ordinance by permitting his dog on the Santa Monica beach. 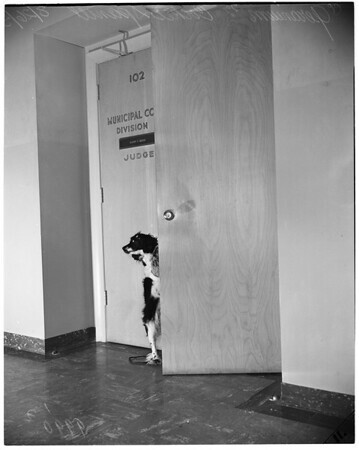 45: 'Geranium', one-year-old black and white cocker spaniel shown leaving courtroom on judge's orders and also waiting anxiously outside courtroom while his master, Anatole Tartakoff was being tried on a charge of violating a Santa Monica city ordinance by permitting the dog on the beach."